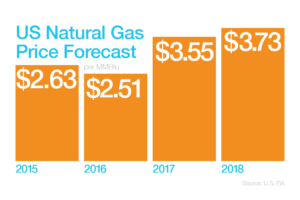 2017 is shaping up to be a volatile year in electrical prices. Mexico and production that’s predicted to fall for the first time since 2005. With surging prices, it’s now even more crucial to find energy savings where you can. At tekWorx, we provide energy-saving solutions – for any size plant, any mechanical configuration and any control system. In fact, our proven optimization solutions can cut energy costs up to 50%. Learn more about our larger chiller optimization or our smaller chiller optimization solutions and put the Approachable Expertise® of tekWorx to work for you. Contact us with your energy-saving questions and see how we can partner together to achieve a comprehensive chiller plant optimization solution. Plus, follow us on Facebook, Twitter and LinkedIn for our most up-to-date news and events. Nissan upgraded their cooling efficiency at a critical vehicle assembly plant without manufacturing downtime using tekWorx innovative hydronic design and adaptive Control Engine Optimization® solution. The result: Cut energy costs by 40% with a 2-year payback. For UNC’s Charlotte campus, Ameresco requested our hydronic expertise and an adaptive Control Engine Optimization CEO® system that exceed the original kW/ton reduction targets. The result: Cut cooling costs by 30% under performance contract. Year in and year out, you can count on Approachable Expertise® from our team of highly skilled engineers who will design, install and support your unique chiller plant solution. Cut out handwritten log sheets and get the technology that self-diagnoses any problems for you. Did you know? Chillers can lose up to 30% efficiency and still appear to operate adequately. We hope 2017 is a fantastic year for our clients and we look forward to creating efficiencies for our current and new customers alike. Contact us ith your next project request and follow us on Facebook, Twitter and LinkedIn for the most up-to-date news and events. Deutsche Bank estimates that, due to the tremendous opportunities apparent in energy efficiency, an investment of $289 billion in retrofitting buildings across the United States would result in energy savings in excess of $1 trillion. This equates to three dollars in savings produced for every dollar used to optimize facilities. Although many companies become dismayed by high upfront costs, retrofitting existing facilities goes a long way toward buildings’ bottom line, satisfying both shareholders and management. One of the largest consumers of commercial energy is air conditioning units, representing up to 30% of all plant energy expenditures. As predicted by Deutsche Bank, retrofitting these buildings for greater energy efficiency means more money for the company in the long run, especially when optimizing chiller plants using tekWorx advanced CEO® system. Designed on an industrial PLC platform, tekWorx system focuses on increasing efficiencies, recovering lost capacity, and improving redundancy through adaptive control algorithms. 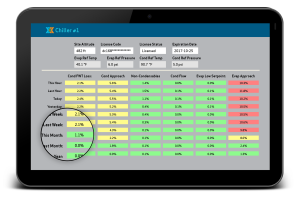 Complete our Chiller Plant Evaluation Form today to find out how much tekWorx can save your building. Our Approachable Engineers like to share some of their recent favorite blogs and stories covering energy efficiency from around the web. Greentech Media always provides some fascinating insight into energy efficiency. In case you may have missed some of their summer stories, they’ve rounded up their top ten clean energy articles. 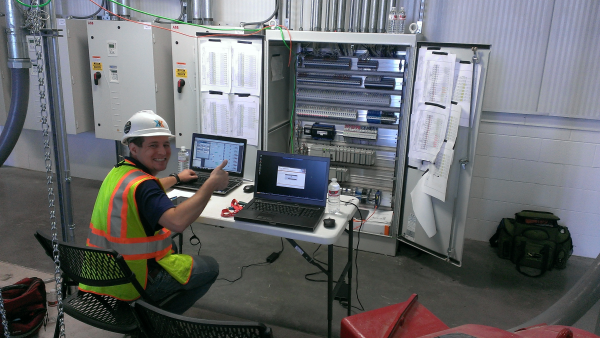 Here on our blog, we’ve talked about the importance of energy benchmarking before. Environmental Leader looks at a new report highlighting the importance of life cycle costing in energy benchmarking for smart buildings. Also, our second Ask an Engineer on Demand Charges has been featured on The Controls Freak this week! We’re excited to continue working with the site and we hope to field more questions soon! Stay tuned for more Approachable Expertise! Energy Engineers are Developing Their Own Careers: Plant Engineering investigates how energy engineers are taking charge of increasing their own skill sets and, thereby, enhancing their careers. University Activism Could Influence Corporate Sustainability: Colleges have begun to divest from non-sustainable energy, and GreenBiz sees that college campuses could become the new influencers on sustainability for corporations and beyond. 8 Tips for Simplifying the Energy Management Process: Energy Manager Today provides an 8-pronged energy management guide with tips for energy management including finding incentives and project implementation. Be sure to follow us on Twitter for more stories and updates! Stay tuned for more Approachable Expertise! Stay tuned for more pictures from the road and more Approachable Expertise! Also, check out The Controls Freak today to see fantastic content on control systems. Our “Ask an Engineer” article on DP Sensors was featured on the site recently! Still have any questions on Chiller Plant Efficiency? Our Approachable Experts are here to help! The deadline for questions for this month is Wednesday, July 24th. Please feel free to submit your questions today for tekWorx engineers in the comment section below. 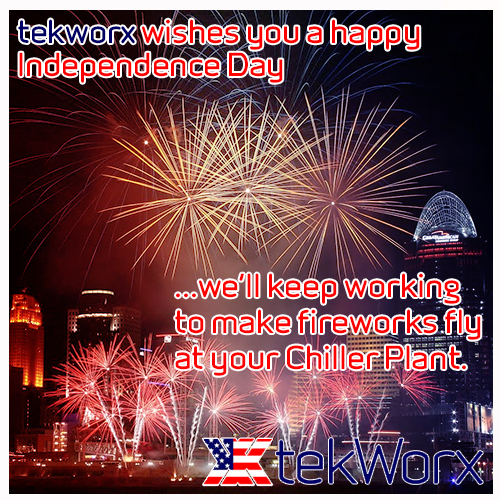 tekWorx wishes you a Happy Independence Day! In that spirit, stay tuned to our blog for more updates on Chiller Plant Efficiency! 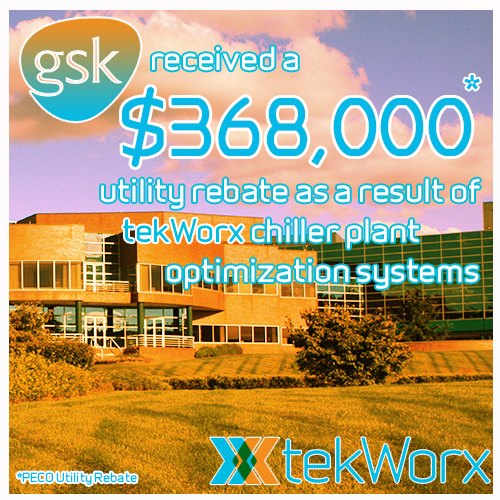 Chiller Plant Optimization helped GSK fetch a huge utility rebate! What could tekWorx Approachable Expertise do for your central plant? View more on the entire article at HFM Magazine, including the importance of demand-response systems in the power grid. HFM also has tips for health care facility managers to keep in mind as it pertains to chiller plants and getting the most of out them. Health Care Design takes a stab at the true costs of health care centers implementing or not implementing green energy measures, including central plant optimization. TekWorx CEO® System has been able to bring energy efficiency to central plants in various health care centers .See how tekWorx chiller plant expertise can work for your plant through continual commissioning and adaptive control technology.